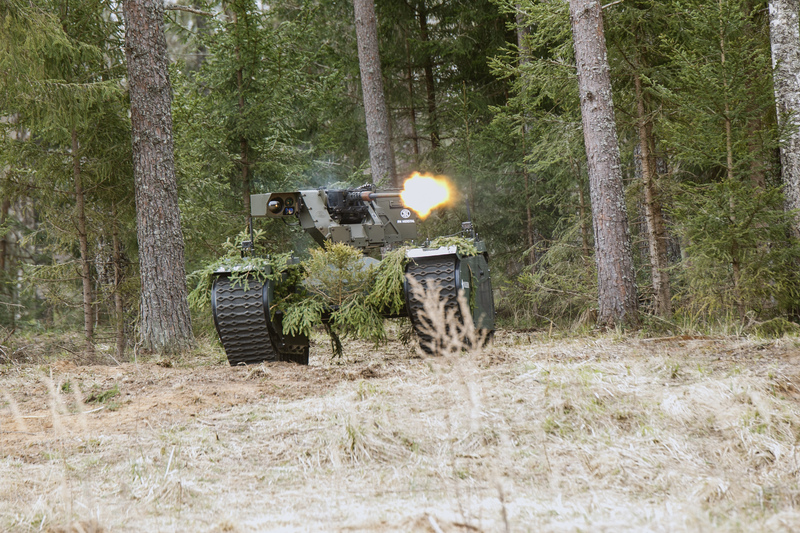 A live demo was held by Estonian Defence Industry companies on 17th of May in the Defence Forces central training area to demonstrate the functioning of new refence solutions in a combat situation. «Today’s supra-company combat simulation exercise, which is carried out within the Estonian Defence Force’s annual «Spring Storm» exercise, successfully used the products of Estonian defence companies and the equipment of the Defence Forces. We saw how innovative military equipment, such as Milrem’s unmanned ground vehicles and the unmanned aerial systems of Threod Systems and ELI cooperated in a combat situation by exchanging real-time information and supporting the attack team, thereby helping to defeat the adversary», explained Pärnamäe, adding that while the ammunition used in the simulation exercise may have seemed realistic, it was actually the training ammunition developed by Bristol Trust, which is also used in everyday training for its high safety. This effectively demonstrates the capacity of Estonian defence companies to contribute to security, defence training and modern combat equipment. «While the defence industry is often considered to be a «playground for big boys» and is inaccessible to newcomers, both ELI and Threod Systems, for example, have become world class defence equipment suppliers and have won defence tenders in both the East and West. ELI has received the largest order in the history of the Estonian defence industry from the Azerbaijan authorities. Milrem, a developer of UGVs, is participating in the US Army’s SMET programme for unmanned ground vehicles», highlighted Pärnamäe, adding that while the Estonian defence companies are small on a global scale, they show enormous potential. Kuldar Väärsi, Chairman of the Board of Milrem, said that the development activities of Estonian defence companies are focused on long-term plans that take into account the diverse uses of the products and the changes in defence technologies. This may be why Estonian defence companies have managed to gain a foothold in the competition against large and well-established defence industry companies. «Today’s live demo shows how various smart robotic solutions developed by Estonian companies improve the combat capacity of troops in terms of both situation awareness, manoeuvrability and firepower». Tõnu Vaher, Manager of ELI OÜ, the manufacturer of the unmanned aerial systems used in the simulation exercise and the holder of the title of «Defence Industry Company of the Year 2016», said that cooperation with both the Defence Forces and other defence companies is crucial because it provides feedback on their products, and enables the company to invest in product development that take into account the changed needs. «For example, our multirotors can be used on the battlefield in cooperation with the Defence Forces, but drones have an important role in border protection and in ensuring security in cooperation with Defendec and other defence companies», said Vaher. Villiko Nurmoja, representative of the unmanned aerial systems developer Threod Systems OÜ, said that cooperation between Estonian defence industry companies enables operators to succeed in the world and become established in large markets. «Integrating different systems is also beneficial to end-users because it speeds up the decision-making process and enhances the effect. In order to gain and share experiences, Threod Systems is flying its UAVs throughout the Spring Storm exercise and performing different reconnaissance tasks in accordance with the exercise scenario», explained Nurmoja.